For the past few years, it seemed that bikebags were getting larger and more expensive. But the popularity of tiny folding bikes seems to have pushed the market in the other direction. Tokyu Hands now offers two that are much, MUCH smaller than the traditional ones. The bag is even designed to allow you the option of leaving the rear wheel on the bike so you can roll it (rather awkwardly) in front of you as you walk. The other one, bearing the brand name Mont-Bell, is a bit heavier than that and quite a bit more expensive (6,800 yen), but it’s the most compact one I’ve ever seen. 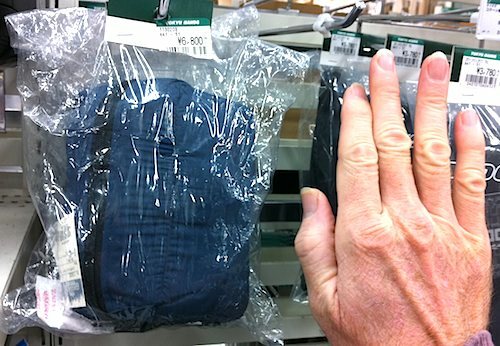 The bag also folds up to about the size of your palm. And did I mention how light it is? Lastly, the material does seem pretty tough. 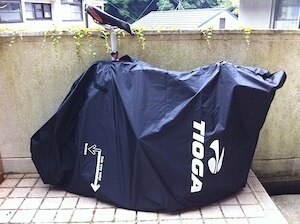 -Since it’s a tight fit, it will probably take you longer to pack the bike - no more 3-minute rush jobs. The verdict: if I’m on a long trip and will be packing and repacking the bike — and ESPECIALLY if I’m entrusting it to baggage handlers on a bus or airplane — I think I’d want to take a regular bikebag, at least until I get used to this one and also figure out a way to protect the forks, chainring and derailleur. But this bag is going in my bikepack permanently from now on (yes, it’s that light; use a lighter strap than the ones they’ve provided and you’ll never know it’s there). That way I’ll always have a solution if I suddenly need to take a train or bus home. Since these reports were posted, the bikebag market has continued to evolve, and thankfully the direction appears to be toward lighter, more compact bags. 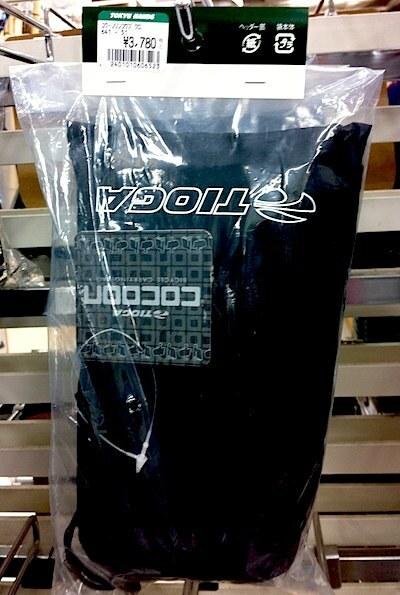 There also appear to be more bags that are designed specifically for road bikes. On the Tioga side, the Tioga Cocoon mentioned above is still available. 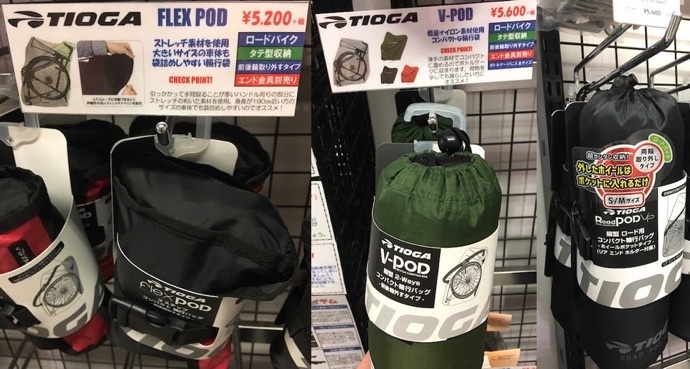 Tioga also offers three new types that are not much heavier than the Cocoon, all designed for road bikes: the Flex Pod (¥5,200) and V-POD (¥5,600), lightweight bags that apparently have no wheel pockets and do not come with the end bracket (which we don’t use most of the time anyway). The difference between the two seems to be mainly that the V-POD is more compact (small enough to fit in the bottle cage, though putting it there means you won’t be able to hydrate properly!). There is also a Road Pod (¥5,600) which appears to be a standard bikebag with wheel pockets that comes with the end bracket. 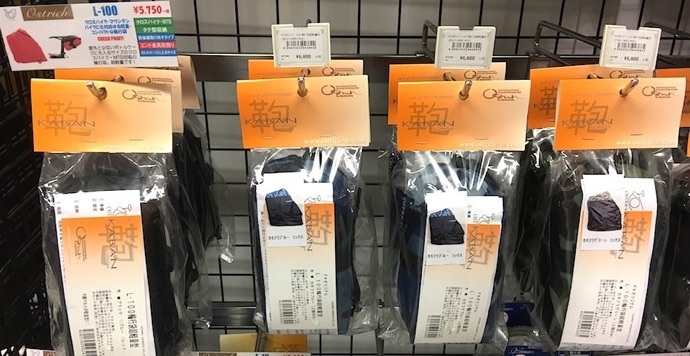 Since there are so many varieties, you should probably go to a fairly large bike shop to ensure the best selection — smaller bike shops and stores like Tokyu Hands are likely to offer only a few of the many varieties available.